"Don't sit under the apple tree with anyone else but me." 1. Preheat oven to 350°F. Butter a 8-inch square x 2-inch glass baking pan. 2. Place apple slices in the pan and sprinkle with the lemon juice. Toss lightly. 3. Place the flour, sugar, cinnamon, and salt in a medium mixing bowl. Cut the butter into it using two knives in a cross hatch fashion until the butter crumbles are pea sized resembling coarse meal. Add the pecans. 4. Place the crumb mixture evenly over the apples, making sure the edges are well sealed. Bake until the top is golden, approximately 1 hour. Serve immediately or reheat. Enjoy enormously. Note: Feel free to toss in dried cranberries, cherries, or use hazelnuts or walnuts. More and more cooks are learning that the sassy flavor of chutney served alongside of chicken, duck, game, pork, cheese or in hot or cold sandwiches makes flavors sparkle. 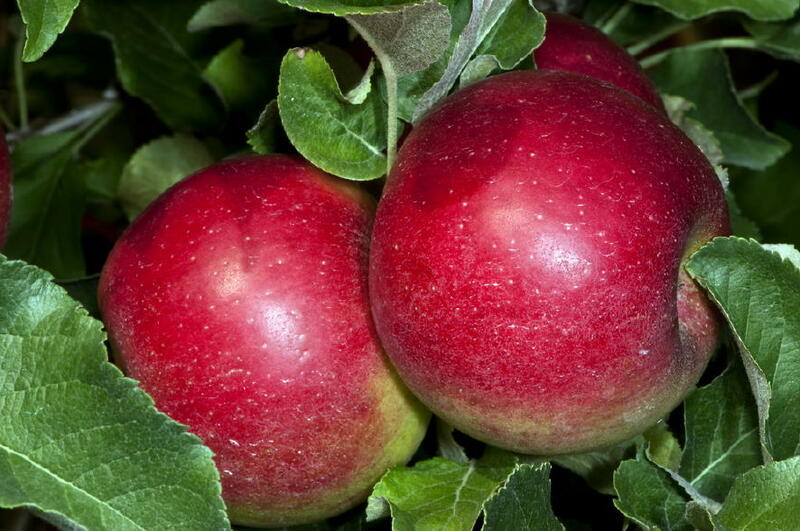 Gather apples while you may and make your own. It’s very simple. This recipe can easily be increased or decreased. Yields 6 pints..
1. Place all ingredients in a 4 quart non-reactive saucepan. Bring to a simmer, and stirring often, cook over low heat, partially covered until thick, about to 2 hours. Stir often, particularly toward the end to prevent scorching. Can while hot; or let cool, then cover and refrigerate for up to one month. Gift this treasure to friends. Ravishingly caramelized apples on a crisp circle of flaky puff pastry; for four decades, our favorite apple tart!! 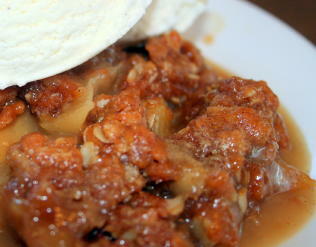 Best served warm with crème fraiche or vanilla ice cream. Serves 8. Note: Please read the recipe through completely, before you begin. 1. Poach the apples according to the recipe below**, removing the apples from the syrup while they are still slightly firm. Transfer the apples to a strainer set over a bowl and allow them to cool completely. Preheat the oven to 425°F. Preheating is very important to ensure that the puff pastry rises. 2. Meanwhile, pour the sugar and water into a 10-inch cast iron frying pan and stir to combine. Set over medium heat and cook, watching carefully, until the sugar syrup reaches a golden brown. Remove immediately from the heat and set the pan on a cool surface. The caramelized sugar will harden. 3. When the poached apples have cooled, place 1 apple half, rounded side down, on the caramelized sugar in the center of the pan. Surround with 6 of the remaining halves, placing them close together. Slice the last half into 6 slices and place them in the spaces between the apples in the ring, with their rounded edges outward. 4. Melt the butter in a saucepan. Whisk in the lemon juice, nutmeg, and Calvados, and drizzle over the apples. 5. Roll out the puff pastry to ¼ inch thickness and cut out a round 12 inches in diameter. Place over the apples and roll the edges of the pastry back 1 inch all around to give the edges a finished look. 6. Place the tart in the oven. 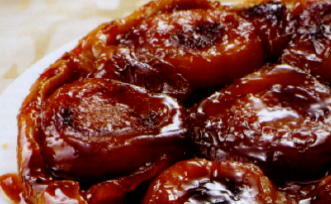 Bake until the pastry is a deep golden brown and the syrup is bubbling around the edges, 35-40 minutes. If the pastry browns too quickly, cover it with a piece of aluminum foil. When the tart is done, remove it from the oven and let it rest for 15 minutes. Invert onto a serving platter and serve warm or at room temperature. Poached fruits may be cooked ahead of time and refrigerated for 2-3 days until you are ready to use them. 1. Combine the sugar, cinnamon stick, cloves, vanilla bean, lemon zest in 1 quart of water. 2. Simmer for 10 minutes. Add the fruit of your choice. 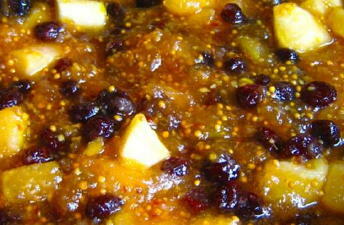 Bring the syrup back to a simmer and cook the fruit gently until the fruit is tender buy still firm, about 12 minutes. Do not overcook!! 3. Remove the fruit from the syrup and allow to cool completely in a strainer set over a bowl.